Welcome to the Week 3 Running Back Rankings! It’s definitely rough out there for the runners. There are some big names who are not playing and we have a few full blown committee situations as well. Once you stare at it for a while, you want to just close the spread sheet and have a beer. As much as I was tempted to go that way, I had an espresso instead and dug into this mess. I’ll keep grinding away and hopefully I’ll feel better about where things are on Saturday. Now, while things are tough for us seasonal players, the daily pool is just fine. Keep your eyes on Philly, because Corey Clement could quickly become the Week 3 chalk if Ajayi can’t go. Latavius Murray will also get quite chalky if Dalvin Cook is ruled out as I expect him to be. So keep your head on a swivel! I’ll be back later on with the TEs. 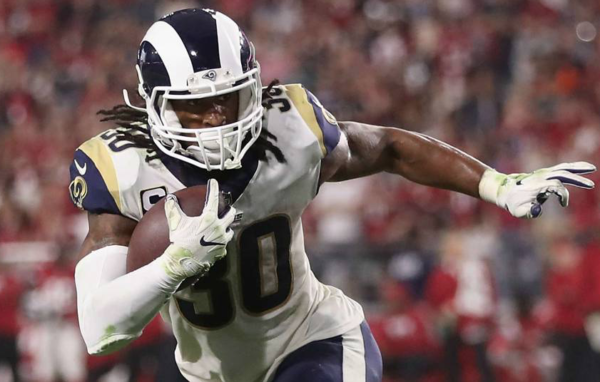 1 Todd Gurley II LAR 9.200 LAC@LAR 09/23/2018 04:05PM ET He’s just a monster right now. 2 Alvin Kamara NO 9.500 NO@ATL 09/23/2018 01:00PM ET Good matchup for him. No way they do anything but feed him this week. 3 Ezekiel Elliott DAL 7.700 DAL@SEA 09/23/2018 04:25PM ET Looking very good but the blocking’s been just ok.
4 Christian McCaffrey CAR 7.800 CIN@CAR 09/23/2018 01:00PM ET Maybe higher in full PPR. He’s eating targets for breakfast, lunch and dinner. 5 James Conner PIT 7.500 PIT@TB 09/24/2018 08:15PM ET Volume locked in until Bell wakes up and smells some reality. 6 Saquon Barkley NYG 7.600 NYG@HOU 09/23/2018 01:00PM ET They HAVE to use him and they HAVE to get more creative with him as a receiver. Now watch them stay the same. Either way, he’s getting the ball. 7 Melvin Gordon III LAC 7.400 LAC@LAR 09/23/2018 04:05PM ET Tough matchup, but his volume is always there. 8 David Johnson ARI 7.200 CHI@ARI 09/23/2018 04:25PM ET Kills me putting him here and I’m hopeful that they start using him right. Tough matchup the way the Bears are playing defense. 9 Leonard Fournette JAX 6.900 TEN@JAX 09/23/2018 01:00PM ET Sounds like he’ll be back, but still no full practice so make sure you have a plan B. 10 Jordan Howard CHI 6.500 CHI@ARI 09/23/2018 04:25PM ET Like this game for him because he should have a lead. 11 Latavius Murray MIN 5.800 BUF@MIN 09/23/2018 01:00PM ET Could get a ton of touches this week. Potentially a RB1 once we know Cook’s status. ***UPDATE*** He’s starting and without Cook active, he should get a very large share of the goings on. They should annihilate the Bills so game script is in his favor—decidedly. 12 Kareem Hunt KC 6.000 SF@KC 09/23/2018 01:00PM ET I expect a good game. He’s a nice buy low right now. Spencer Ware may sit this week, which would give Hunt a slight bump. 13 Tevin Coleman ATL 6.400 NO@ATL 09/23/2018 01:00PM ET Gave up more snaps to Ito Smith than I was hoping for but clearly the lead dog without Freeman. Not sure he shouldn’t be playing ahead of Devonta to be honest. 14 Giovani Bernard CIN 5.900 CIN@CAR 09/23/2018 01:00PM ET Looked very agile last week and is practicing fully (knee) so he’s good to go. No Mixon this week so fire Gio up! 15 Kenyan Drake MIA 5.600 OAK@MIA 09/23/2018 01:00PM ET He’s looked good and is playing well ahead of Gore in terms of job share. Solid matchup here. 16 Matt Breida SF 5.400 SF@KC 09/23/2018 01:00PM ET Wow, did he look good last week. Seriously, the stats jump off the page but so does his play. He’s old school. Love the way he runs. I hope you took him over Alf like I told you too! There’s more upside with Breida. I think he’s “the guy” now, but it will still be a time share. Morris handles volume well and Breida’s a smaller back. 17 Corey Clement PHI 4.300 IND@PHI 09/23/2018 01:00PM ET Will bump him a few pegs if/when Ajayi is ruled out. 18 Lamar Miller HOU 5.000 NYG@HOU 09/23/2018 01:00PM ET Running very well right now despite the poor blocking. Should return value at this price on DK. 19 Chris Thompson WAS 6.300 GB@WAS 09/23/2018 01:00PM ET Bump him up a few spots in full PPR. 20 Alex Collins BAL 5.200 DEN@BAL 09/23/2018 01:00PM ET I think he gets things going now. Maybe not this week in a tough matchup, but he’ll battle as always. The key, obviously, is that he avoids fumbling. 21 Marshawn Lynch OAK 4.900 OAK@MIA 09/23/2018 01:00PM ET He is running pretty well but volume is going to keep him down in the rankings. Stick with him as a RB2. 22 Adrian Peterson WAS 4.900 GB@WAS 09/23/2018 01:00PM ET Ran well last week but the game flow was against him. 23 LeSean McCoy BUF 5.100 BUF@MIN 09/23/2018 01:00PM ET Limited practice but seems like he should play (Ribs) ***UPDATE*** Hemade the trip and appears to be playing, but definitely check his Sunday status. He’s a RB2 and a mediocre onne at that in this insanely tough matchup. 24 Dion Lewis TEN 4.500 TEN@JAX 09/23/2018 01:00PM ET Dion is running well, but it’s not in a great offense anymore. 25 Kerryon Johnson DET 4.700 NE@DET 09/23/2018 08:20PM ET Looks excellent but they mistreat lead backs in Detroit as we know. 26 Jamaal Williams GB 4.800 GB@WAS 09/23/2018 01:00PM ET Should be the most-used back in a 3-headed backfield. I think Jones take over at some point, but that’s just my feel. 27 Peyton Barber TB 3.800 PIT@TB 09/24/2018 08:15PM ET He should pick things up soon after having a few real tough matchups—and with the passing game crushing. Things tend to normalize and I suspect they will here. 28 Sony Michel NE 4.000 NE@DET 09/23/2018 08:20PM ET Could have a big game if they give him the carries. Hard to know for sure just yet. 29 Phillip Lindsay DEN 4.600 DEN@BAL 09/23/2018 01:00PM ET Love this kid. Hate that he’s stomping on Freeman’s buzz, but that’s football. I think these two form a nasty backfield for some time. He’s a real thing. If you read my pre-draft RB rankings at WEEI, you know I loved Lindsay’s film. I guess I should have been more open-minded to what he could do as a rookie, but this backfield was so loaded in camp. He’s a nice flex option this week. 30 Rex Burkhead NE 4.200 NE@DET 09/23/2018 08:20PM ET Risky, sure, but I think he’s still the goal line back, so he’s playable after practicing fully. 31 Alfred Morris SF 3.700 SF@KC 09/23/2018 01:00PM ET He’s running very well but Breida’s young legs seem to have the bigger role for now, although Morris is playing slighly more snaps ths far AND has had a few more touches. I doubt that either back takes this thing over. 32 Tarik Cohen CHI 4.700 CHI@ARI 09/23/2018 04:25PM ET I like him in this game. I think they want to find more touches for him. 33 Derrick Henry TEN 4.400 TEN@JAX 09/23/2018 01:00PM ET Running well for a losing team but game flow is killing him. Hang tight and hope things turn. I was impressed with his running last week. 34 Royce Freeman DEN 4.200 DEN@BAL 09/23/2018 01:00PM ET He might be a good buy low right now because the big body usually wins out over time. Tough to trust him this week though. Flex appeal only. 35 Javorius Allen BAL 4.600 DEN@BAL 09/23/2018 01:00PM ET He is what he is. A flex play with more value in PPR and some chances at the goal line. 36 Theo Riddick DET 4.400 NE@DET 09/23/2018 08:20PM ET Has some PPR appeal. 37 Austin Ekeler LAC 4.400 LAC@LAR 09/23/2018 04:05PM ET Tough to see him doing it this week. 38 James White NE 4.900 NE@DET 09/23/2018 08:20PM ET Should see less snaps this week assuming Burkhead and Sony are both fully healthy. 39 Chris Carson SEA 4.300 DAL@SEA 09/23/2018 04:25PM ET Tough to trust as is Pete Carroll. Flex if you need him. 40 Nyheim Hines IND 3.600 IND@PHI 09/23/2018 01:00PM ET If Mack sits, I think he’s a real sleeper for a good game. 41 Rashaad Penny SEA 4.100 DAL@SEA 09/23/2018 04:25PM ET He looks better to me versus Carson, but Carson has the coach’s trust and that matters. Both are risky flex plays right now. Prosise is playing snaps too, so this backfield is a dumpster fire. 42 Aaron Jones GB 4.300 GB@WAS 09/23/2018 01:00PM ET A player to watch closely this week but no way you play him unless desperate. 43 T.J. Yeldon JAX 5.100 TEN@JAX 09/23/2018 01:00PM ET Has a sore ankle but practiced Thursday so looking like a good bet to play. 44 Corey Grant JAX 4.300 TEN@JAX 09/23/2018 01:00PM ET Coud play a big role if Yaldon or Fournette sits, but could also go back to play just a few snaps. I’ll adjust him accordingly when I update. 47 LeGarrette Blount DET 4.100 NE@DET 09/23/2018 08:20PM ET He’s killing Kerryon’s value—by playing pretty well, to be fair. 50 Wendell Smallwood PHI 3.000 IND@PHI 09/23/2018 01:00PM ET He’s a sneaky flex in SUPER deep league this week—assuming Sproles and Ajayi both sit. 72 Jay Ajayi PHI 5.700 IND@PHI 09/23/2018 01:00PM ET ***UPDATE*** He’s OUT. No practice (back), so he may miss Week 3. Clement and Smallwood will hold down the firt in his absence—if he sits. 76 Le'Veon Bell PIT 9.000 PIT@TB 09/24/2018 08:15PM ET No signs of life yet. Still in parts unknown. 78 Carlos Hyde CLE 4.800 NYJ@CLE 09/20/2018 08:20PM ET (ALREADY PLAYED) I think he starst losing time to Chubb, but it hasn’t happened at all yet so stick with him as a RB2. 79 Bilal Powell NYJ 5.300 NYJ@CLE 09/20/2018 08:20PM ET (ALREADY PLAYED) Splitting time (pretty evenly) with Crowell and looking pretty good out there as usual. 80 Isaiah Crowell NYJ 4.500 NYJ@CLE 09/20/2018 08:20PM ET (ALREADY PLAYED) Should be up for this game against his old team. Hope the Jets give him a lot of carries. They will if they are smart. I dig IC when he’s running angry.